Real Estate Image Enhancement service– Enhance real estate photos with good quality will give the thousand meaning from its single image. Making your real estate images for image enhancement technique is important to expose the better visibility for your customer. Real Estate Companies need the appealing photography effect for its images to make the simple looking images into most attractive. Real Estate Image Enhancement service is not a single service. It includes the editing and adjusting techniques of color cast removal, brightness and contrast correction and the exposure adjustment. For the real estate photo session, it requires the brilliant photographers, but Most of the real estate photographers are fails to keep the entire levels and appearance with perfect level. They are facing some problems like the imperfection of lights, wrong backgrounds settings, blurry focus quality and the distortions etc. During the real estate photo shoot, it will happen without the knowledge of the photographer. If any of this article reader affect by this imperfection just send all your real estate images to us for the Enhance real estate photo editing service. 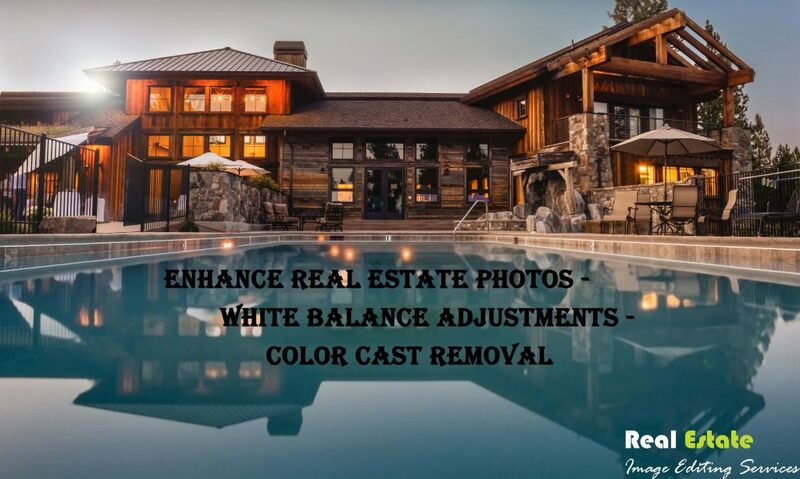 If you have any of your unbalanced real estate image affected by the white balance contact ‘Real Estate Image Editing Service’ immediately for this white balance adjustment service. For this color cast removal and the white balance adjustment service, it requires accuracy. The accurate image retouching services of this white balance adjustment and color cast removal service provided by our graphical real estate image editors by very cheapest cost and provide by the free trial of service. Having the experienced graphical editors and creative skilled people for handles the editing techniques.